South Park slot machine brings to life characters from the US television show that goes by the same name. It is just as exhilarating and unpredictable as the show itself. There is a wide range of bonuses, animated missions and talking symbols that make the slot game extremely fun. You do not need to be a huge fun of South Park TV show to like this slot game. The fact that there are many interesting features and bonus rounds will be reason enough to like the game. The graphics are crisp and interesting. There is no way you are going to get bored playing this game. And if you are lucky, you can win a massive amount of cash. 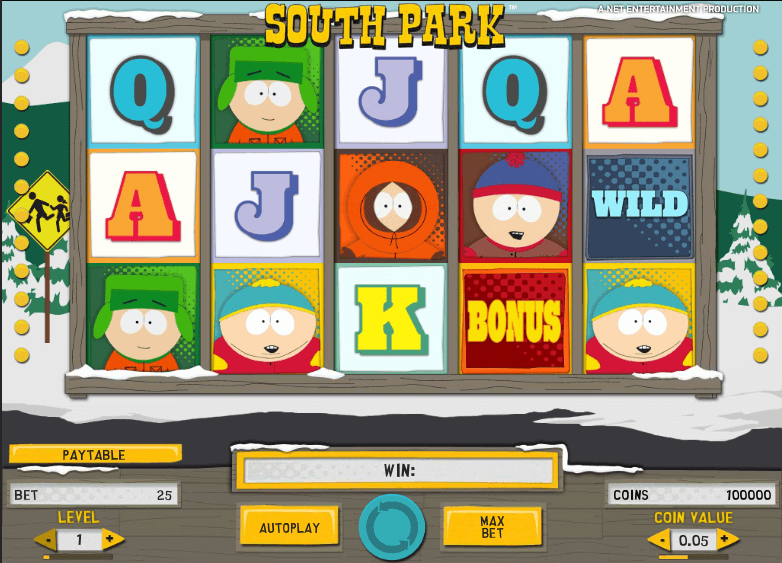 South Park slot machine has an interesting playing panel that features 5 reels and 25 paylines. It also features wilds, bonus games, free spins, sticky wilds, as well as three mini features. The bonuses in this game are many, and the wins that you can get from them are high. Every bonus features something new, which makes the slot game innovative and interesting. It will be amazing to see how the South Park theme comes alive when you are playing this game. The bonus games that you should watch for include Kyle bonus spin, Kenny bonus game, Cartman bonus game, and Stan bonus spins. Each bonus game is activated by collecting the bonus symbol of the character anywhere on the fifth reel. You can only activate one bonus game at a time, even though the mini features appear any time during these games. This slot comprises a number of special features that will appear on the screen randomly and increase your chances of winning. One of these features is the Mr. Hankey mini feature that may show up arbitrarily on the reels. It splatters from symbol to symbol and transforms them into wilds. Another special feature in this slot game is the Terrance and Phillip mini feature. When this duo appears on the slot machine, it brings forth three wild symbols on the second, third, and fourth reels. These symbols can substitute any other symbol on the reels except the bonus symbol. You will also love the Cartman mini feature that is comprised of Cartman in a beefcake mode. It creates a block of wild symbols that allow for large wins as well as multiple combinations on the payline. It appears only from the second to the fourth reel. South Park slot is a very generous casino game. It gives you the chance of winning up to 1,250,000 coins. You can get this payout while playing all the 25 lines during the Cartman bonsus game, and the coin values usually from 0.01 to 0.50. During the Cartman bonus game that gives you the opportunity of the getting the highest payout, you will be hunting for hippies that feature coin prizes and 2x multipliers. There is also a symbol that can reset the bonus game. You need to make sure that you do not get too many warnings or a Game Over symbol because that will end the bonus game. There are also some nice payouts in the other bonus games. In the Kenny bonus game, you can win up to 139,000 coins. You are supposed to successfully help Kenny from being run over by a car to get in this bonus game. South Park slot machine will surprise you with its execution because everything seems to work perfectly well. It has wins that are higher than average and the bonuses and features have incredible amounts and diversity. Whether you are a beginner or experienced gambler, this slot will fit very well for you. It does not have any progressive jackpots to chase, but if you happen to hit the Cartman feature or one of the bonus rounds, you will most likely be in for a big payday. 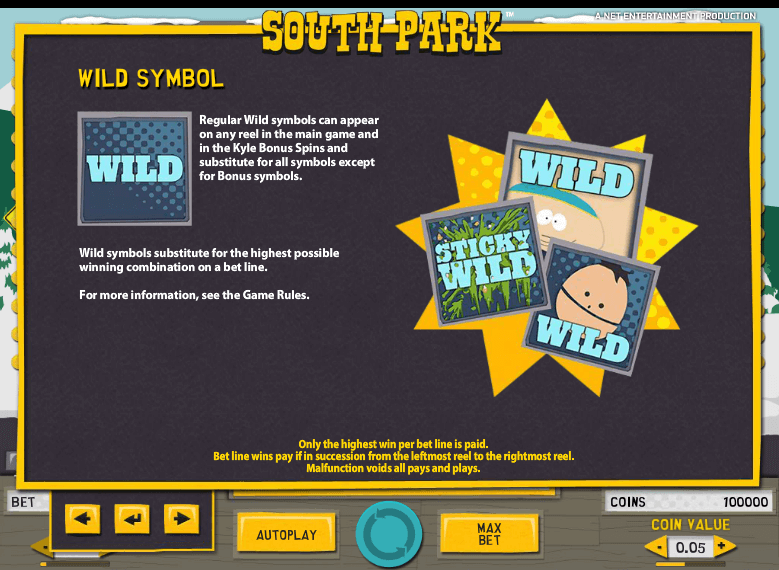 You can play South Park slot for real money at Vegas Paradise and Jackpot Paradise casinos. These two casinos have a lot of interesting things, including amazing welcome bonuses. When you sign up for a new player account at Vegas Paradise, you will get a $200 Bonus plus 100 free spins. At Jackpot Paradise, you will get a $200 welcome package plus 100 free spins!